In a hidden corner of Hua Qiang Bei there are two large buildings that are primarily dedicated to cellphones. These, however, aren’t the same as the cellphone malls found in the district’s main street. 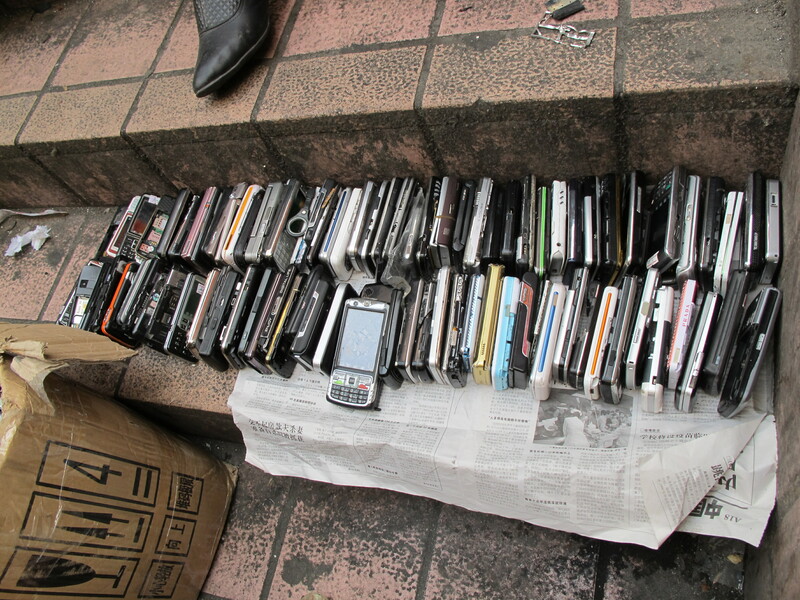 Here cellphones are traded as a commodity or even as a raw material. Hundreds of small companies work with (and against) each other to squeeze every bit of value out of yesterday’s mobile phones. Due to the vendors’ reluctance to give up ‘business secrets’, it’s hard to get many of my questions answered or to trace the exact source of the devices that are brought here. 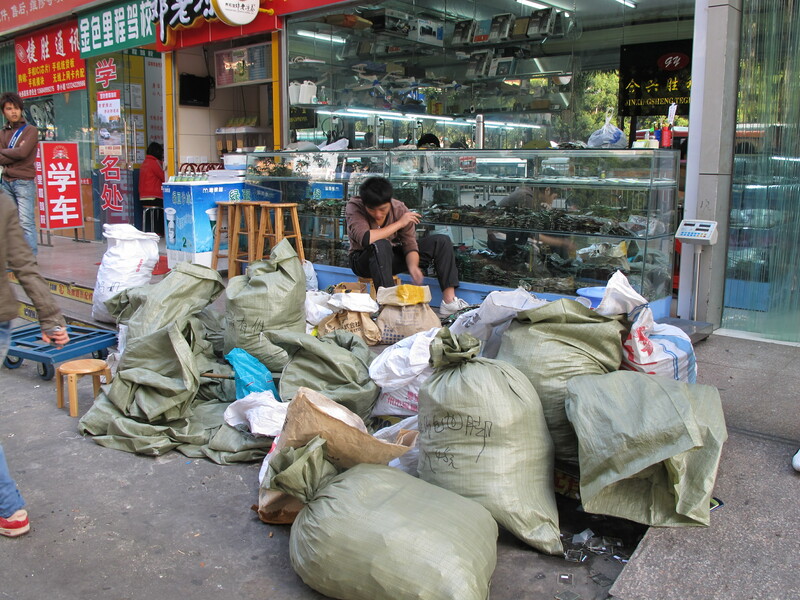 Some outdoor vendors have so few phones that it looks like they personally collected them from the trash to sell them in the adjacent street market. 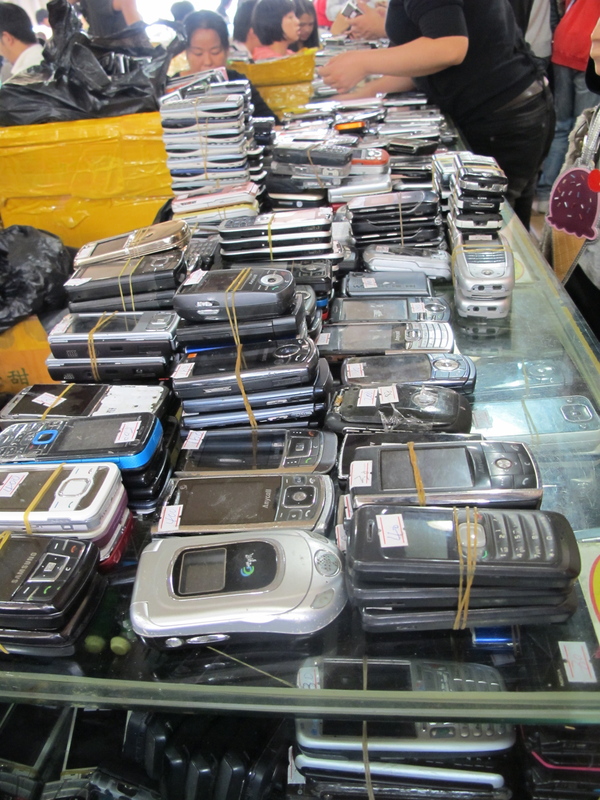 Within one of the main buildings there is a large room dedicated to stalls selling these pre-owned phones. Each stall presents a couple of hundred of them. I often see them bundled together in threes or fours, though not always by type. Most of these phones look like they would still function but there are quite a few with cracked screens or other obvious damage. Apparently, they still hold value for whomever buys them. 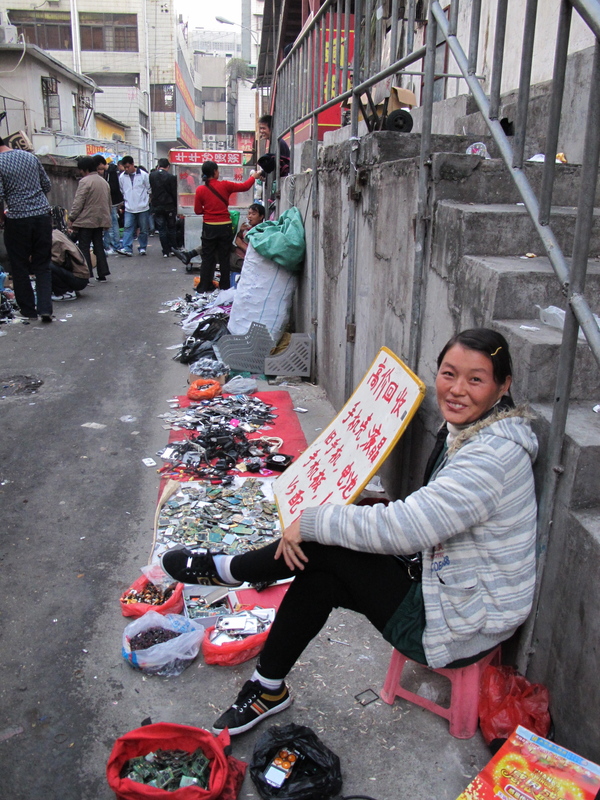 One entrepreneur I talked to, told me he bought his phones in bulk from a wholesaler who got them from garbage sorters in Hong Kong and other major cities in Asia. I was most intrigued by the building dedicated to the down- and up- cycling of these phones. 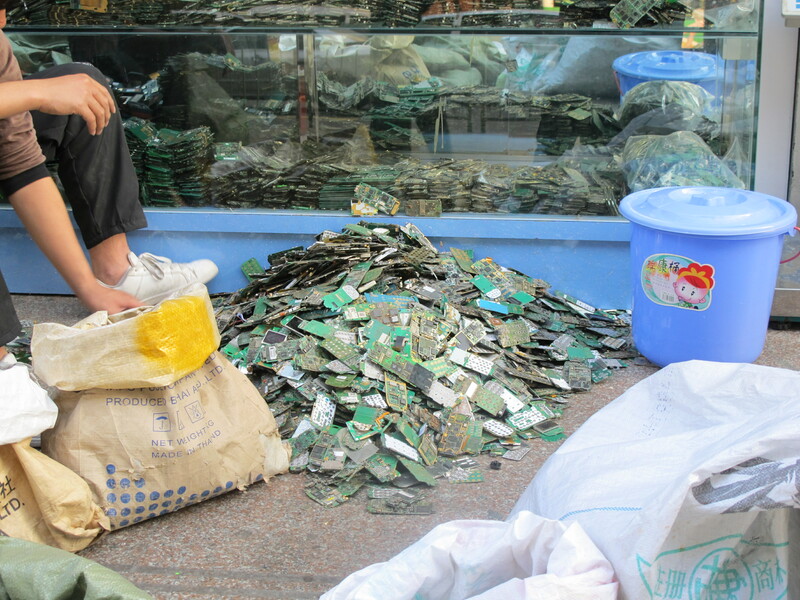 Outside, I see a guy sorting through big bags of phone circuit boards. 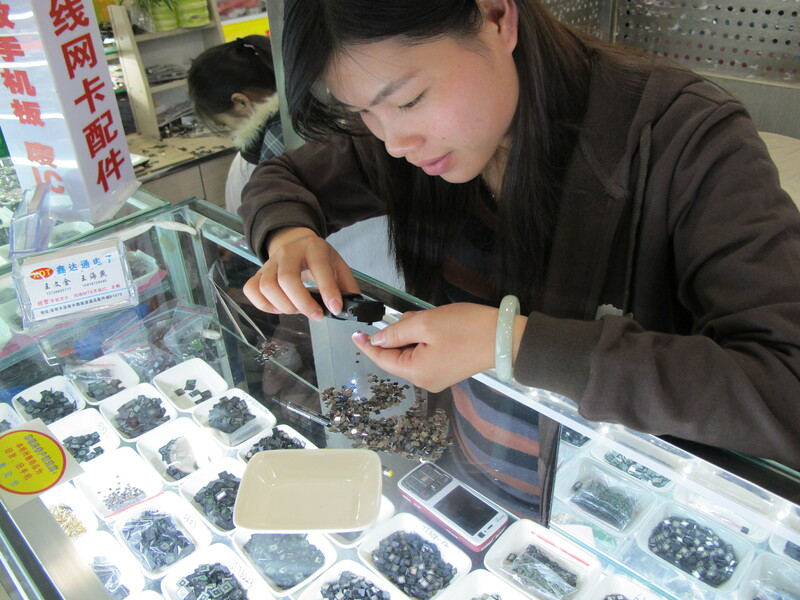 I’m not sure but I think he might be picking out the ones with particular chipsets that are in demand right now. At some, point the plastic shells have already been removed to be recycled in another process. 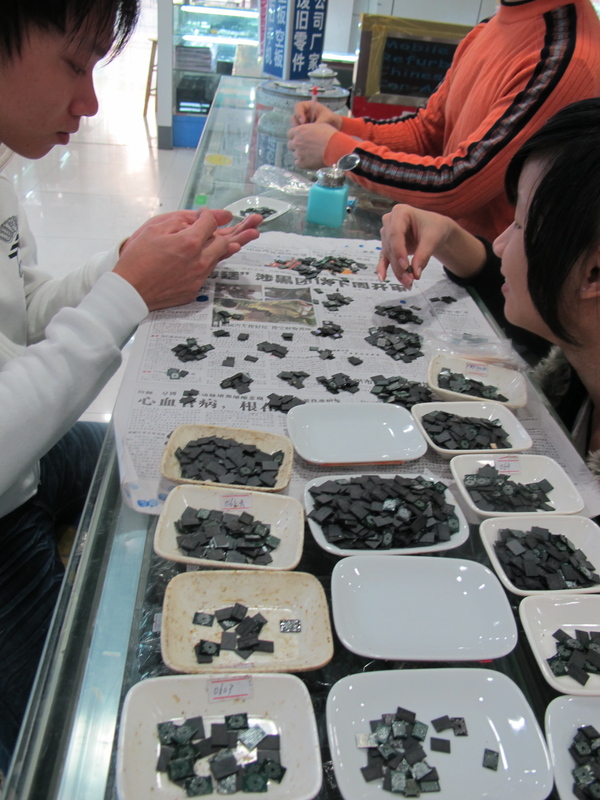 There isn’t much money to be made there, but the low price of Chinese labor makes it worth someone’s time to separate the last bits of metal from the plastic. Next, the boards are put under a heat gun to loosen the solder on the SMC’s (Surface Mounted Components). Then the components are picked off one by one with a set of tweezers and pre-sorted. The components are often sold to another company in the building that specializes in the next step of the process. 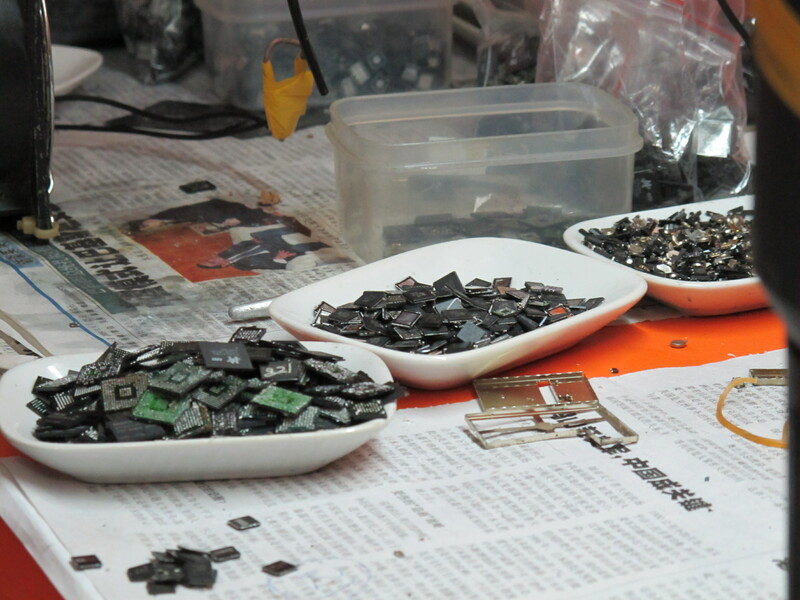 Next, the solder is removed and the components are cleaned and sorted further. For many of the shops, this seems to be the main activity. With some exceptions, this work seems to be predominantly done by teenage girls and young women. Some of the parts are so small that they can only be handled with tweezers. 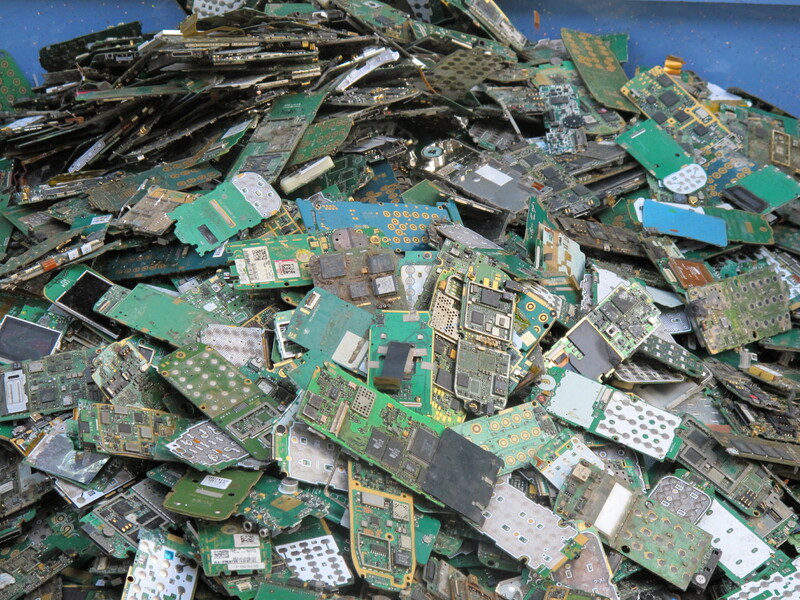 Behold the precious jewels of our information society! 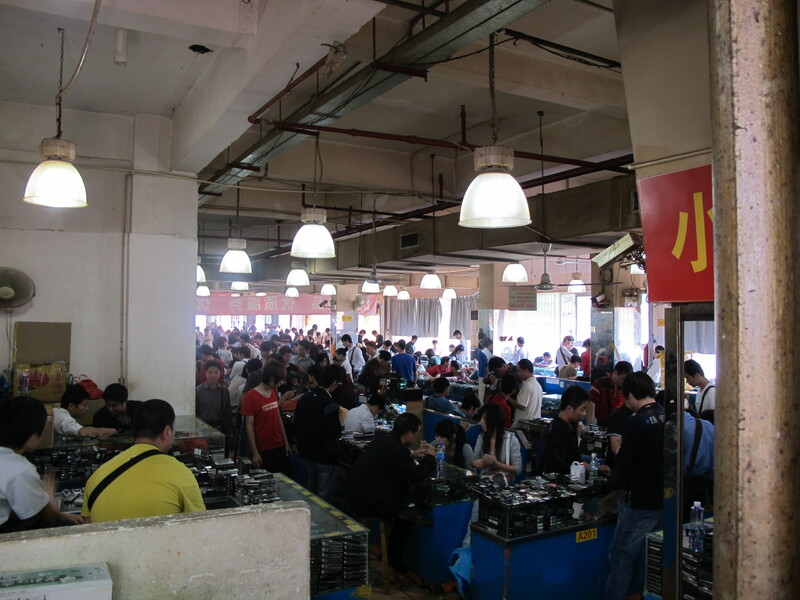 Although the components that are sold here don’t have the best reputation, there are a number of quality control methods used to make sure everything is still in working order. One of them is an optical check for any obvious damage. 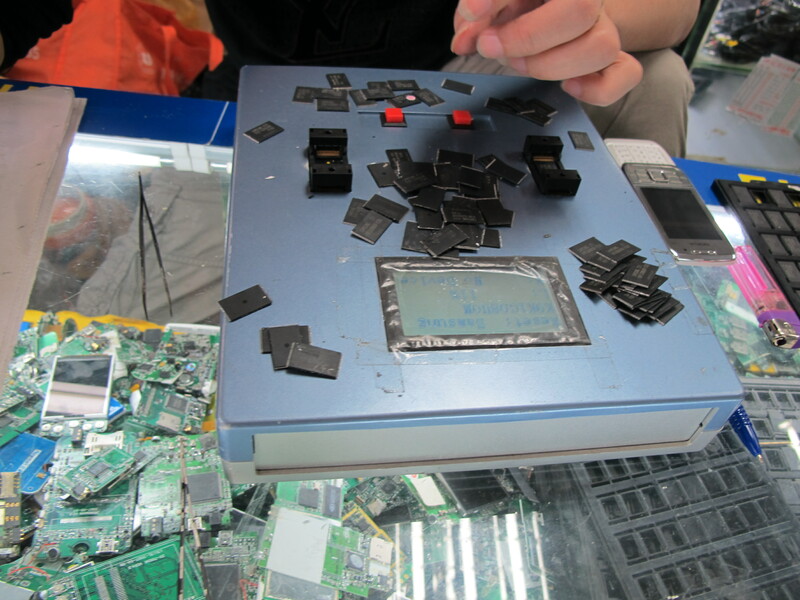 More interesting are test setups that use rewired versions of the devices that the chips original came from. These boxes are made-to-order for specific phones and specific parts. The shop that sells them is one of several tool suppliers in the building. 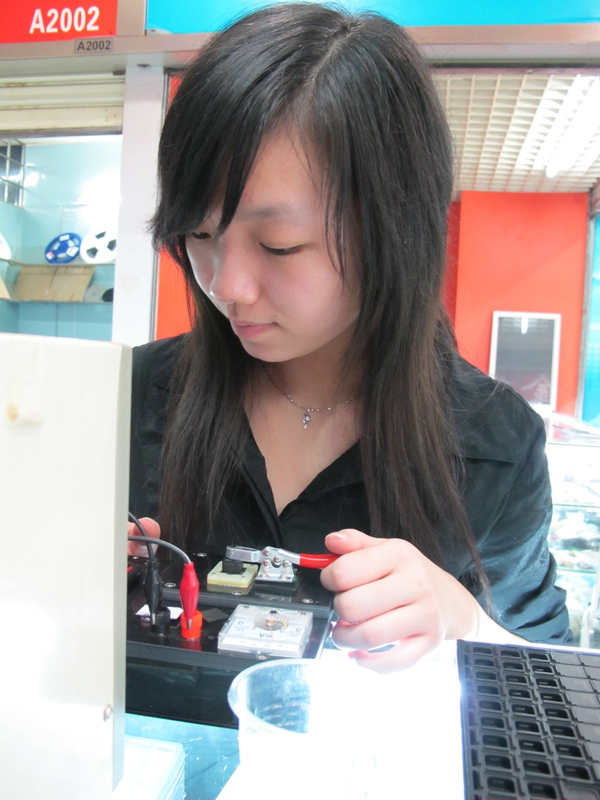 There are others selling soldering irons, heat guns and books with circuit board schematics. Finally the most valuable chips get reprogrammed or flashed and packaged into trays and tape reels (I’ve seen them do it!) that can be fed into the pick-and-place robots used to build new devices. 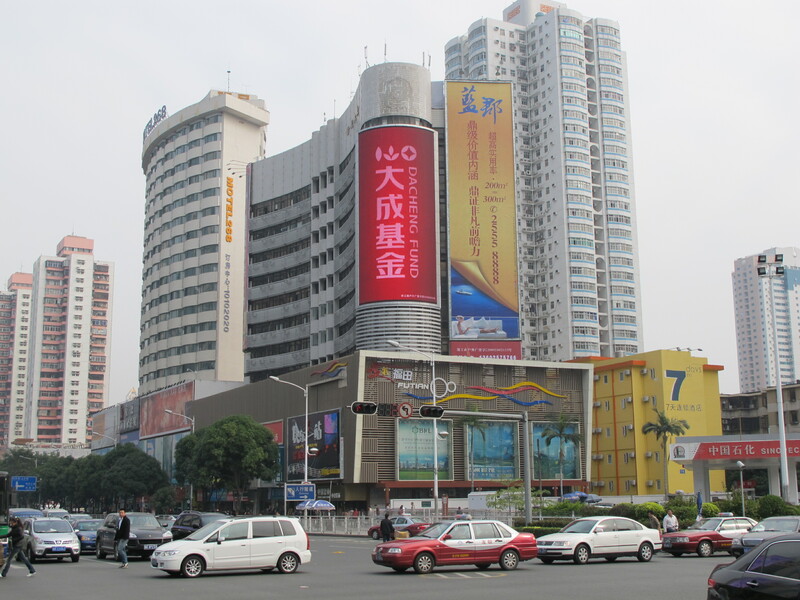 The next post will be dedicated to the other activities in this building, such as the (partial) fabrication of Shanzai phones.